We've got a Cordova based iOS app that does not use push notifications. As of Cordova 3.5.0, each submission we have made to the app store results in an email informing us that our app includes API used to register with Apple's Push Notification Service, but doesn't have push notification entitlement. The app has been accepted each time, as we don't actually use push notifications for anything. However, I would like to avoid triggering this warning in case Apple decides to change their policy as to whether these API references are acceptable. We did not experience the issue with prior versions of Cordova, and have done no work in Objective-C ourselves. Is this a known issue with Cordova 3.5? Searching has yielded some folks with similar problems but I've only found solutions for people wanting to add push entitlements, (rather than figure out where the Push API is being referenced and remove it). I took a look at the Cordova issues ML, but didn't find anything there. Any other leads that folks are aware of would be appreciated! Krik is right ! I've found this API calls in /Classes/AppDelegate.m certainly generated by Cordova 3.5. I din't tried it for the moment, but these lines can certainly be commented in xCode to avoid Apple's warnings. While commenting out the offending code in Classes\AppDelegate.m will get your app approved, you want to continue benefitting from future Cordova upgrades so the best way to do this is to turn on the DISABLE_PUSH_NOTIFICATIONS symbol during compilation so this bit of code gets left out. 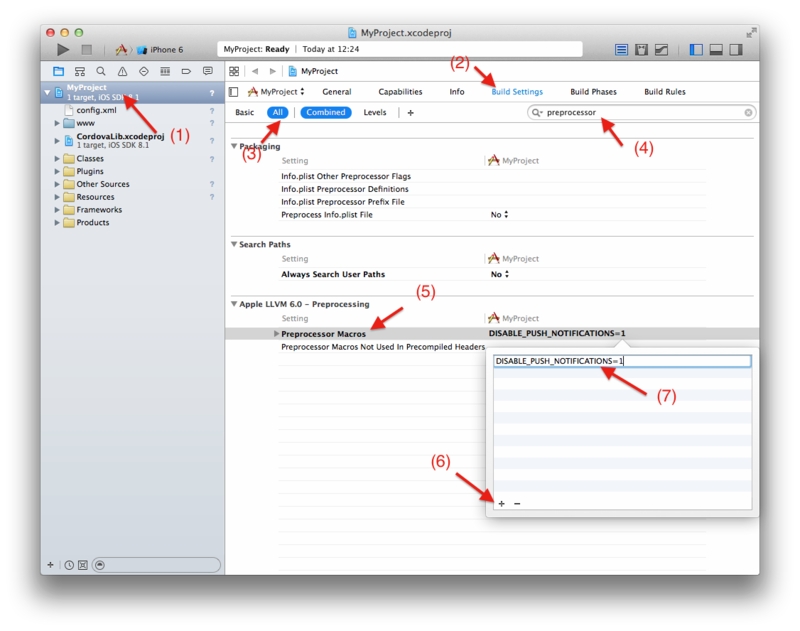 I come from a C# background so I understand conditional compilation but I am new to XCode so I had to do a bit of research finding out how to define compilation symbols via the UI. Hope this helps other people out there in same situation. The dead code, files need to be removed. I found a Cordova on_platform_add hook script that will edit project.pbxproj with that flag for you when you install the iOS platform. I needed to npm install xcode to get the hook script to work. Both kirk and r121 are correct. In more recent versions of Cordova, this offending code is now helpfully generated inside a wrapper of #ifndef DISABLE_PUSH_NOTIFICATIONS. All you need do is add-DISABLE_PUSH_NOTIFICATIONS to your compiler flags. That's set in target/Build Settings/Custom Compiler Flags/(both C and C++ release) for those building inside XCode. which just makes the problem go away. Not the answer you're looking for? Browse other questions tagged android ios cordova or ask your own question.